For as long as I can remember post spawn bass fishing has gotten a bad rap. The theory among many anglers is that *Micropterus Salmoides* goes into some kind of a weird funk during late April and May resulting in a case of lockjaw so severe that you can’t hardly buy a bite. Texas bass pros Jim Tutt of Longview, Stephen Johnston of Hemphill and Keith Combs of Huntington don’t put much stock in all the negative chalk talk. In fact, all three anglers agreed that it is more of a fallacy than anything else. Like Combs and Tutt, Johnston’s living depends on his ability to catch bass 12 months a year. The Toledo Bend guide says fishing during the post spawn is no different than the pre-spawn, summer or fall in that the main keys are being in the right areas and employing the proper tactics to catch fish. Johnston said there is a period right after the spawn winds down when bass may become sort of difficult to catch, mainly because of stress factors that slow their metabolism and makes them reluctant to chase. Jim Tutt says that some anglers just use the “post spawn blues” as an excuse for not catching anything. Johnston offered two key words of advice to anglers who find themselves in situation when the fish don’t seem to be cooperating — slow down. As earlier mentioned, bass that occupy the north end of a large impoundment lake will likely be much farther along in the recovery process than those that live down south. Johnston says these fish will naturally be more energized and willing to cooperate than those that are just coming off beds. Once the bass’ spawning duties are complete, Tutt says many of the fish will begin finning their way out of spawning pockets towards main lake hangouts located in closer proximity to deeper water. The Ranger pro staffer pointed out that the move doesn’t occur overnight. Instead, it occurs in stages with the bass taking the same paths to deeper water that they followed when moving shallow. Tutt says certain types of areas will be more prone to hold fish than others. While creeks, ditches and drains that connect deep water to shallow are always worth a look, he is much more fond of main lake and secondary points. He named a Rebel Pop-R, Stanley Ribbit Frog and Senko as his go-to baits on most Texas lakes. Combs is a big fan of points, as well. On Lake Falcon, underwater ledges, ridges other stuff that can’t be seen with the naked eye can be productive, as well. Carolina rig, deep crank baits, football jigs and Texas rigs get top billing. 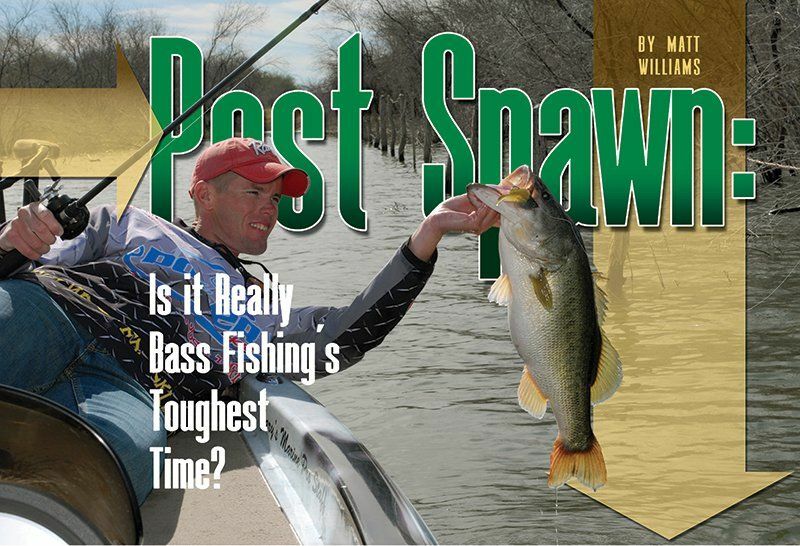 May marks the beginning of the spawning season for bream on many lakes across Texas. This means there there will be tons of the feisty pan fish occupying skinny water in large colonies that may contain 50 or more spawning beds in a 10X10 area. Catching bass during the post spawn isn’t rocket science, but it does require anglers to make some adjustments in lure selection and fishing locations. Take some time to figure out the puzzle and bass fishing’s toughest time may eventually become your favorite time.